According to Gobbler Country, the first rumor linking Virginia Tech defensive coordinator Bud Foster to a vacant coaching job involves Frank Beamer's long-time lieutenant and Vanderbilt, whose interim head coach Robbie Caldwell resigned prior to the Commodores' final regular season game. 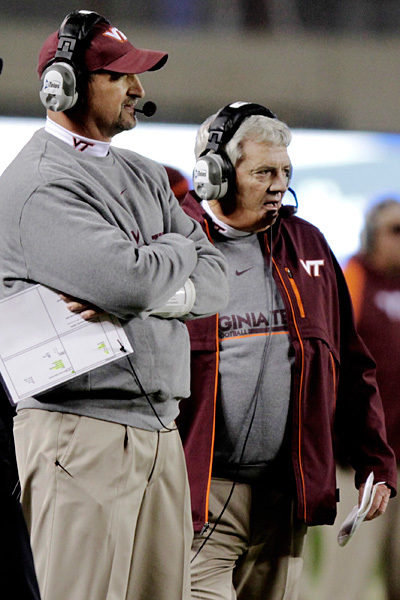 The first place to connect Foster to Vanderbilt was a site called Football Scoop, which on Monday said their sources had told them "Vanderbilt intends to talk with Virginia Tech defensive coordinator Bud Foster sometime after Saturday." Tuesday saw several much more official source tackle the rumor, including Foster himself. Darryl Slater, Kyle Tucker and Norm Wood already have stories up after talking to Foster about the possibility of heading to Vandy. 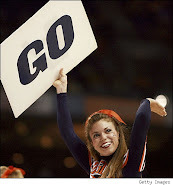 He told reporters he hasn't been contact by Vanderbilt. The job could interest Foster because the Commodores are in the SEC and thus would be the BCS-level coaching job he desires. 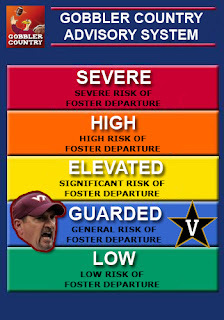 However, as all three writers point out, Foster has avoided jobs in the past that he considers "coach killers" (though he didn't call Vanderbilt that) and Vandy is a tough, tough place to win football games. On the Commodore side of things, Foster isn't being mentioned by either The Tennessean or SB Nation's Vanderbilt blog Anchor of Gold as being on Vandy's radar yet. The Tennessean reports the apple of Vanderbilt's eye is Temple head coach and former UVa defensive coordinator Al Golden. Anchor of Gold would love to see Mike Leach get the job (Doesn't every fanbase?). 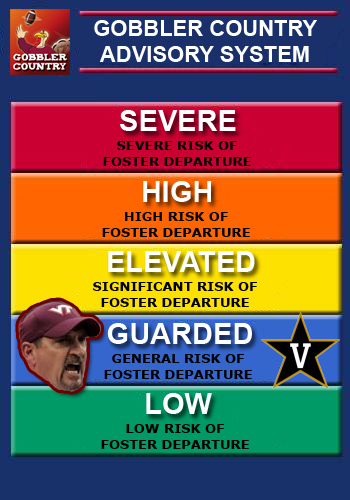 For now, we're introducing the Bud Foster Alert System and moving it up to Guarded. There are positives and negatives, Foster hasn't dismissed the job and there's at least an inkling that at some point he could become a candidate. Nothing to get excited about yet, but that could change if Golden says, "No," and the 'Dores have to look elsewhere.